Saturday- Another quiet day for us. I continued my PT exercises, watched TV. played games on the Ipad, read, and took a nap. Bob picked up dinner from the Lodge. It was a pulled pork sandwich with coleslaw and potato chips. Sunday – We paid bills and did our usual budgeting. We are starting to pre-plan our trip when we leave here. We need to go to South Dakota to renew our drivers licenses. It has been over 5 years that we have been traveling!!! We did some laundry, took a short nap, and put a chicken in the crock pot. A quiet day. Monday- We took off for PT this morning. This is my first day of the outpatient PT. Torture! Sara has me doing more this time. She moves the knee cap around so that I do not get scar tissue there, and when she was done I literally had a hole in the knee. It is called ‘pitting edema’, that is swelling that you can push in on and the spot stays. That is how much swelling I have on the knee cap. I was exhausted afterwards and returned home to relax. Tuesday- I always have a bad day after PT the day before, so it was a quiet day for us. MaryAnne and Ray arrived today to stay at the Lodge for a few weeks. We were really excited to see them. They got settled and MaryAnne came to visit. We went to dinner at the Lodge with them. We had Chicken Cordon Blue for dinner. Wednesday- It was a beautiful day with the air clearing out and we could actually see the mountains. Bob went shopping at Costco and Walmart ,so I went outside with the dogs and read my book while sitting in the recliner. Ah, heaven to be out of the MH. We were going to go for dinner at the Lodge, but the menu did not appeal. So we ate dinner at home. Thursday– I was back to PT today. This knee is so different from the first knee. It remains more swollen, but I am able to bend the knee better. Sara looked at me and said “ I don’t want to jinx this, but have you noticed that you are able to do better this time?” Yup! I am much farther along in PT and exercises. Now if the swelling would just go away…. It was Taco Thursday at the Lodge, se we went down with MaryAnne and Ray for dinner. Ray needs ankle surgery and we talked about that at dinner. He is going to make an appointment at Panorama to speak to one of the Doc’s that Sara had suggested. Friday- I did not have a very good day. I just felt awful. My knee was okay, I just did not feel well. I slept a lot and rested, while still doing my PT exercises. Bob has been busy working on our trip when we leave here, looking at mileage, where we will stop for fuel, checking out sites to see, and finding RV parks where we receive discounts. 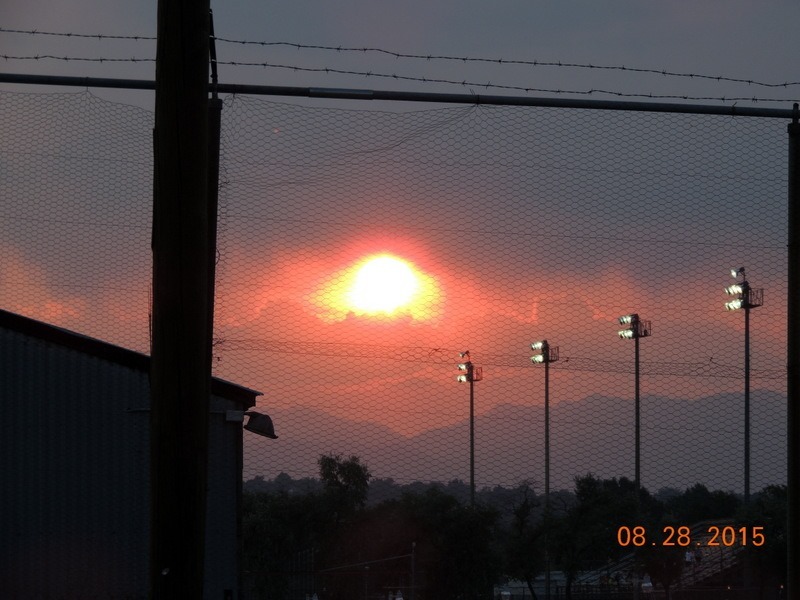 Here is a sunset view from the MH of the mountains.